Each year coinciding with Nurses Week, I write a CNO Perspective report in which I examine a topic that I believe to be of current importance to nurse leaders. This year’s report, Using Integrated Technologies to Solve Today’s Nursing Challenges: a How-to Guide for Nurse Leaders, focuses on the subject of digital transformation. This topic is extremely relevant to solving the top-of-mind challenges nurse leaders are facing today, like how to attract and retain nurses, and how to enable nurses to communicate more easily with physicians and other members of the care team. I explain that relevance in the report, but there is a deeper layer to what I want to get across. I want you as a nurse leader to sit up and take notice of how digital transformation is impacting and will continue to impact the discipline of nursing. And I want you to come away understanding what you can do about it so you can drive the change rather than have change happen to you. In hospitals everywhere, conversations are taking place in which people are determining the technologies nurses will use at the bedside. I encourage you to be at the table and part of these conversations, and not to surrender your power to others. As a nurse leader, you view yourself as an expert in the arena of patient care, not in the field of technology. Yet you have to get involved – because technology decisions affect your nurses and the patients they care for. Clinical technology decisions need your expertise. As part of the report, I’ve provided nurse leaders with a checklist to follow. These are points to be mindful of and to have in place in order to have a successful conversation about technology in the patient care environment. If you reach a point where don’t understand exactly where the conversation is going, find people around you who can support you and give you the advice and guidance you need. Work in partnership with your hospital’s IT leaders. Seek out experts on technology in nursing workflow who can help guide your discussions to ensure nursing is involved. I’ve been committed to technology in nursing for quite a long while now because I’ve seen the positive transformation it can allow in practice. I’ve seen how adoption of the right tools at the bedside can ease burnout and frustration and improve the patient care experience. I encourage you to read the 2018 CNO Perspective report, reach out to me, and let me know what you think. Let’s have a conversation about it. Digital transformation demands a move away from the transactional point-solution approach and toward the strategic integrated-technology approach. Is a clinical expert at the table for every discussion about technology clinicians will use? Don’t allow others to make your decisions for you. Have you begun with the end in mind? Always lead with the patient. Make sure the technology enables the nurse to interact with the patient and focuses on the patient as the center to streamline the nurse’s workflow. Your end result will be a better patient outcome and happier staff. Are the solutions you’re considering and the technology strategy you’re building user friendly? Make sure you’re setting up a sustainable workflow that makes it easier for nurses to get their job done. Does the solution solve more than one problem? Make sure it doesn’t solve one problem while creating three more. Is the solution sustainable? Make sure it will be able to grow and integrate throughout your organization over time. Do you have expansion or facility construction in mind? Can the solution scale to support all locations within the extended system? If you change clinical practice guidelines, will you be able to customize the solution to support the new protocols? Have you incorporated the nurse perspective? Nurses are experts on the care environment and need to be part of defining technology requirements. Include nurses in the process of making decisions from the bottom up to help ensure their buy-in and adoption. 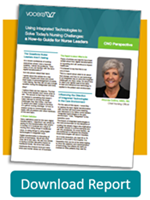 Read the 2018 CNO Perspective report, Using Integrated Technologies to Solve Today’s Nursing Challenges: a How-to Guide for Nurse Leaders.